CRAZY DISCOUNT! Was: $549.95 Now: $299.99! 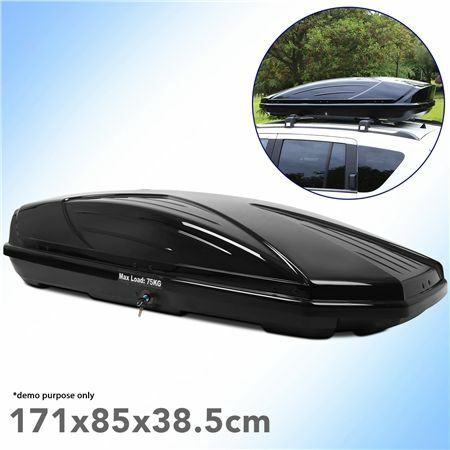 If you're planning a road trip and need to free up space inside the car, then check out this new 450L Car Roof Storage Pod! With a capacity of 450 Litres and a maximum load weight of 75kg, there's enough size and strength to hold the biggest and bulkiest of your items. When you're travelling, comfort is key, and who wants to be crammed up inside the car with all your suitcases and bags and whatever other items you're taking along? Store your luggage safely on the roof of your car and free up space inside with this car roof storage box! This roof storage unit arrives to you completely assembled and ready to use, so just strap it on and get on the road! Keep the family comfortable inside the car while you're bulky items are out, and order your new 450L Car Roof Storage Pod today! Recieved my car roof pod yesterday in great condition fast delivery as well.